Heat a large skillet over medium high heat. Add bacon and cook until brown and crispy, flipping once, about 3-4 minutes. 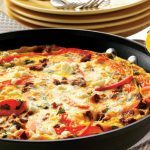 Drain excess fat; reserving 1 tablespoon in the skillet. Transfer bacon to a paper towel-lined plate. Add eggs to the skillet. Cook until white is set but yolk is still runny, about 2-3 minutes; season with salt and pepper, to taste. Place a slice of cheese over each egg during the last 30 seconds of cooking time; set aside. With a butter knife, spread butter on each slice of bread. Place bread in the skillet and toast, flipping once, until golden brown, about 2-3 minutes. To assemble the sandwiches, place 4 slices bread on a work surface. 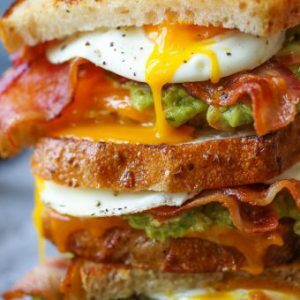 Spread with guacamole, topped with bacon, egg, cheese and another slice of bread. *Any type of bread of your choice can be substituted.